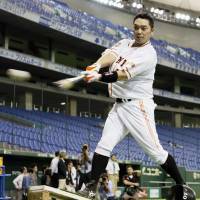 A few seasons ago, in 2012, the Yomiuri Giants won the Japan Series just a few days after the San Francisco Giants clinched the World Series title. While the two teams already shared a nickname and color scheme, it was the first time they’d reached the pinnacle of their respective leagues in the same season. Another similarity was that both teams featured catchers with uncanny offensive ability. 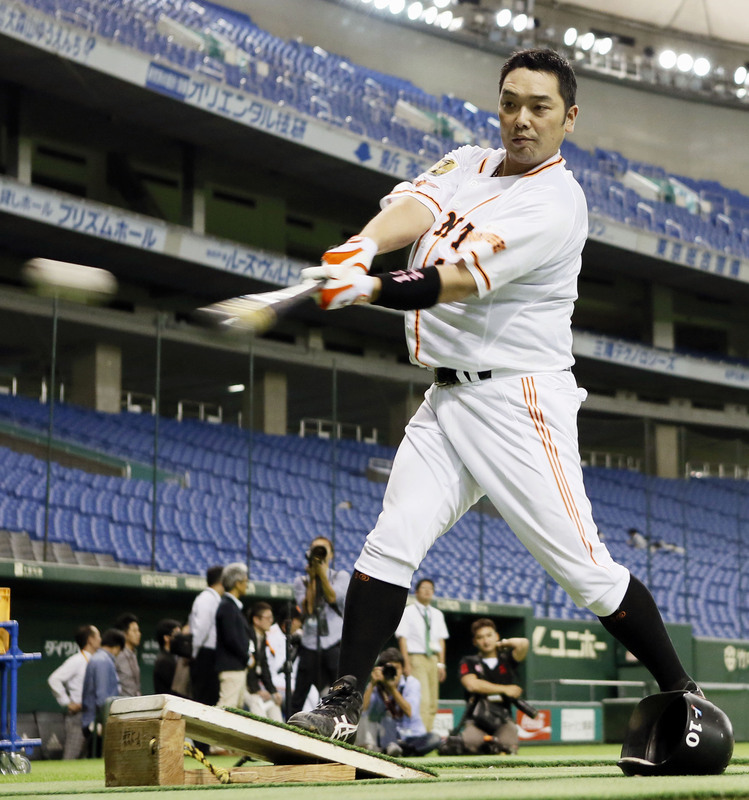 Yomiuri’s Shinnosuke Abe won the Central League batting title, and nearly the Triple Crown, on his way to the 2012 CL MVP Award, while San Francisco’s Buster Posey won the National League batting title and was named NL MVP after the season. That’s a commonality that will end this year because while there have been murmurs of moving Posey to first base more often, Abe will actually make the transition this year, trading his catcher’s mask for a first baseman’s mitt. First base has long been a safe haven for offensive-minded catchers, with teams hoping to preserve their bodies and offensive output before the wear and tear of catching becomes too great to bear. It’s why Abe is making the move this year, after a 2014 season that saw his numbers at the plate experience a sharp decline. Last year, Abe hit .248, his lowest average since his rookie year in 2001, managed 19 home runs and drove in 57 runs, his lowest totals in those categories since 2006. He also struck out 77 times (he only whiffed 59 times in 2013), his most since 2010. His .765 on-base plus slugging percentage was the second-lowest of his career and he simply just didn’t look very good over prolonged stretches. Minor injuries played a role, but mostly it looked like Abe might have been wearing down. The Giants have been spoiled by Abe’s offensive output for the past several years. There aren’t many catchers able to generate the numbers Abe was putting up, and it gave the Giants a bonus other teams simply didn’t enjoy at that spot in the lineup. He was so good that his sudden decline stuck out like a sore thumb, even among the collective underachievement of the Giants as a whole. Abe was merely a shell of himself, prone to brief explosions of vintage Abe heroics in what was a mostly mundane campaign. So the Giants are lessening Abe’s load and moving the 35-year-old to first, jettisoning the team’s 2014 home run leader Jose Lopez to make room, in hopes of keeping him healthy and reviving his bat. That, however, leaves a giant hole at catcher, especially from an offensive standpoint. From 2009-2013, Abe ripped off a five-year stretch that would match up with anything a catcher has been able to produce since all-time great Katsuya Nomura shot into the stratosphere with four consecutive 40-home run, 100-RBI years for the Nankai Hawks from 1962-65. Nomura’s run was snapped in 1966, when he “only” knocked 34 out of the park and finished with 97 RBIs. Abe didn’t approach that level of production, but hit .300 over his five-year period of productivity, averaging 31 home runs and 85 RBIs a year over that span, during which he also had a .953 on-base plus slugging percentage. His MVP season in 2012 was one of the great years by a Japanese catcher. Abe led the Central League with a .340 average and 104 RBIs that season. He just missed the Triple Crown with 27 home runs, second to Tokyo Yakult Swallows slugger Wladimir Balentien’s 31. Abe may be better without the strains of catching, but the Giants still have to replace him. For the moment, the task appears to have two candidates, newly acquired veteran Ryoji Aikawa, three years Abe’s elder, and second-year player Seiji Kobayashi. Nothing in Aikawa’s past suggests he can pack the punch Abe did. Entering his 17th season, Aikawa is a career .259 hitter with 65 home runs and 451 RBIs (Abe has a career .287 average, 346 home runs and 1,037 RBIs) and Kobayashi is still developing. Abe may well get his swagger back now that he’s not crouching behind the plate nearly every day, but unless his replacements exceed expectations at the catcher’s spot, so often an afterthought offensively for most teams, the Giants lineup will still lose a lot of its punch going forward in 2015.